Friendship bread, which is also known as Amish sourdough starter bread, is often given similar to the way a chain letter is shared. 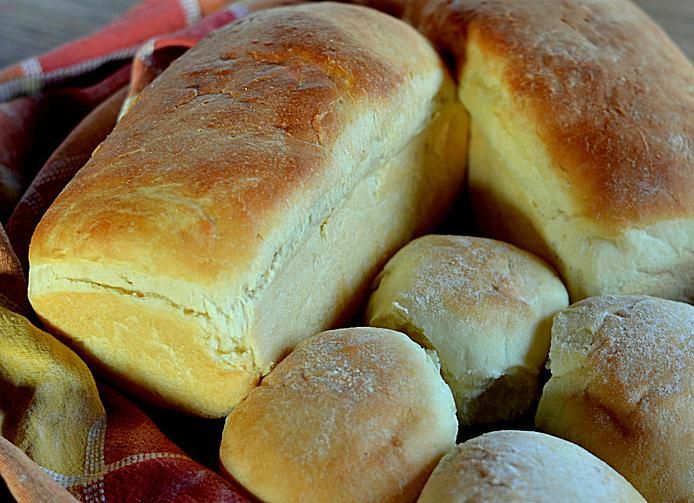 This recipe is ideal for bakers who want to make a variety of bread using this as the base recipe. Stir in 2 1/2 cups flour, salt, sugar and sourdough starter. Combine 2 1/2 cups flour and the baking soda; stir into the sourdough mixture. Keep adding in as much of 1/2 to 1 cup flour as you can, mixing with a spoon. On a lightly floured surface, knead in enough of the remaining flour to make a moderately stiff dough that is smooth and elastic (six to eight minutes total). Shape into a ball and place in a greased bowl. Turn once to grease the top and cover with a clean cloth or plastic wrap. Let rise in a warm place 1 to 1 1/2 hours, or until doubled. Punch down and divide the dough in half. Cover and let rest 10 minutes. Grease two 9-by-5 inch loaf pans or one large baking sheet for 6-inch round loaves. Shape dough into the desired shape. Made X-shaped slashes with a sharp knife. Cover and let rise about 1 hour, or until doubled. Preheat the oven to 400 F. Bake loaves 35 to 40 minutes. Cool on wire racks. Starter mix can be frozen and used later, with the new cycle beginning after the starter mix has thawed. Additionally, it can be slowed to about half the normal fermentation rate when it is stored in the refrigerator instead of at room temperature. This Amish sourdough starter bread recipe makes a starter mix, which is a substitute for baking yeast that can be used to make many kinds of yeast-based bread. It can make Amish cinnamon bread, which uses the starter recipe and adds a cinnamon flavor. When making Amish sourdough bread, it makes five cups. The preparer keeps one cup to create a new cycle of bread-making; he or she then gives the remaining three cups to friends so they can make their own loaves of bread. One cup of starter typically makes a standard loaf of bread. Starter bread is also known as mother bread. There is a timing element to making and sharing Amish friendship bread. The usual cycle is based on the addition of one cup of sugar, flour, and milk every five days. Then the bread is baked and another starter is shared on the 10th day. The 10-day cycle, in all, generates five cups of starter mix, which must be used to either bake a new loaf of bread, share with a friend, or start a new cycle. According to traditions, a person does not have to wait 10 days before using one cup of starter; it can be utilized as a yeast substitute at any time. But using it on earlier days may result in smaller quantities of starter at the end of the cycle. In order to prevent starter mix from running out, it is customary to feed the starter (with milk, sugar, and flour) before removing a cup to use. A five-day baking cycle feeds the starter every fifth day and uses the resulting mixture on that day to bake a loaf or two of bread. The leftover mixture is then used to begin the next five-day fermentation cycle.